January 26 thru 28, 2018 is the 15th Annual Jefferson Quilt show known as “Quilts on the Bayou”. There will be many quilts on display during the weekend. One of the wonderful displays is the Hoffman Challenge traveling trunk show. These are made by individuals around the country. To enter the Hoffman challenge, you need to sign up with the Hoffman manufacturer. Once signed up you will receive material in a specific palette. You can design anything you want using that palette and adding more materials in until you have your own masterpiece to enter. At one point in time I did enter the challenge just for fun. I did not win anything nor was I thinking about winning, I just had fun. I always have a great time walking among all those spectacular quilts that are on display throughout the building, in the hallways and in classrooms. Everywhere you look, you may find that special one that makes your heart soar or brings back a fond memory of a loved one that quilted. As a quilter in a past life, I cannot help visiting with the vendors, touching the gloriously colored 100% cotton material and I will quite often bring home a goodie for my stash. Shhh, don’t tell David. 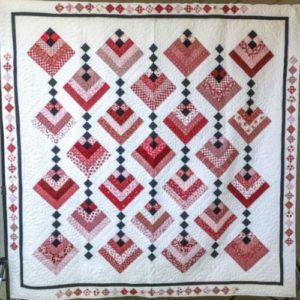 If you love to learn new quilting tricks and tips, I would be sure to sign up for a class or two. Even if you already know plenty of quilting tips, it’s always fun to brush up on those skills. This entry was posted in Quilt Show, Weekend Getaways, Winter Attractions by Tammy D. Bookmark the permalink.